Here are some valuable tips for Gospel Jazz Music Artists to have Effective Band Rehearsals. Any music artist can benefit from these tips as well. Band rehearsals are vital to the development of the band. Even seasoned, professional musicians must practice together repeatedly in order to get the best possible performance from the group. Effective band rehearsal is a must when preparing for any musical performance. This doesn't just happen, you must make it happen. Here are some tips to help you and your band get the most out of rehearsal times. Band Rehearsals are a Big Investment! Keep in mind that rehearsal time is a huge investment. Time and money are often poured into rehearsal time. Both are too valuable to invest for a lousy rehearsal. Time is more valuable than money because once time is spent, you never get it back. No one wants to just throw money away, so don't throw it away on poor band rehearsals. 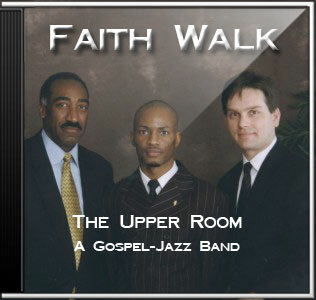 As a Gospel Jazz Music Artist, I was blessed to have a home church that allowed my band, The Upper Room: A Gospel Jazz Band, to use the church to rehearse in. This was a huge benefit to us because we didn't have to pay for a rehearsal room. At $60 or more an hour, the money spent on rehearsing stacks up quickly! Whether you're preparing for performances/gigs, or practicing new songs to add to your repertoire, or preparing for a recording session, you should approach rehearsal with a mind to get the most out of the time (and money) spent. Ban rehearsals are valuable times for working together as a band, and you should all be working towards the same goal and making each other sound as good as possible. It is important to PLAN your rehearsal time. If you don't know your destination, anywhere you end up will do. This is true for rehearsals. If you don't take time to plan and organize your rehearsal time, you'll accept anything (including nothing at all) from the rehearsal time. PLAN ahead of time by setting a schedule for the rehearsal time. Your rehearsal schedule can be a simple "bullet list" indicating which songs your band is going to practice. You can also set aside time in the schedule to discuss business like setup for the next performance. Whatever you decide your schedule should be is fine, just as long as you PLAN by setting a rehearsal schedule. If you don't hit everything on the list, it's okay as long as you make progress as indicated by the list. This will help you to monitor just how much progress your band is making in rehearsals. No one wants to waste time going around in circles and getting frustrated because it seems like your band isn't making progress. That's what can happen when you don't PLAN ahead and set a rehearsal schedule. Your rehearsal schedule should be written down on paper. Anything worth doing is written down! Indicate the amount of time you will dedicate to practice and the amount of time you will dedicate to discussion. A simple rehearsal schedule should include about 2 to 3 songs that you want to practice along with how much time you want to spend on each song. Be sure to include some breaks in your schedule, but not too long - just enough to move around a bit. It's a great idea to record your rehearsals so band members can critique what you worked on. Great ideas and new songs have come from my band's rehearsal tapes! PREPARE early so you don't lose time and money trying to "get ready." This applies rehearsals, performances and other aspects of life. When you PREPARE early, you already know what needs to be done and you get yourself ready to do (PERFORM) what needs to be done. Preparation is done on individually and collectively. Each band member should a rehearsal schedule for instrument practice and getting ready in other ways. Collectively, the band should PREPARE through effective, organized rehearsals and meetings that help the band get ready for whatever is coming up. It is much better to arrive early, setup early, warm up early and then practice for a full hour than to arrive 10 minutes late, spend 10 more minutes setting up, and blow 10 more minutes in practice because you were not warmed up. That leaves only 30 minutes to practice in an hour-long rehearsal! Now you and other band members either rush through the rest of rehearsal or leave frustrated - all because you didn't PREPARE! Preparation really becomes a factor when a band has recording sessions. Each session is timed - and time is money! With studio sessions averaging around $120 per hour, your recording costs can blow your budget if you and your band is not prepared. If you establish a PLAN and PREPARE ahead of time (just like in practice), you will not waste and time or money as you PERFORM at optimal levels. PERFORM in a professional manner. When you PLAN and PREPARE the only thing left to do is PERFORM! This is where you (and your audience) reap the benefits of planning and preparing. Your performance is the end result and you want it to be the best it can be. The only way this will happen is if you PLAN your rehearsals and PREPARE ahead of time. My high school baseball coach used to tell us, "You play how you practice!" He was right! I was able to apply his saying to many different aspects in my life. As a Gospel Jazz Music Artist, I am applying his saying yet again. You are a Professional. Your mindset should be professional. Your rehearsals should be professional. Your performances should be professional. Anything less and you are cheating yourself and your fans out of something special. If you don't approach your rehearsal with the mind of a music professional, your performance will be anything but professional. "You play how you practice!" No one can do you like you. Likewise, no band can do your band like your band. Avoid wasting time and money in the present and in the future by following these tips. PLAN, PREPARE and PERFORM! Keywords: band rehearsals, effective band rehearsals, plan, prepare, perform, gospel jazz music, Some valuable tips for having Effective Band Rehearsals - Gospel Jazz Music Artists.